I love getting dressed up at the best of times so weddings are my favourite! SimplyBe have a fabulous collection of clothing for the Bridesmaid, Maid of Honour or Wedding Guests and I thought I would share some of the pieces I am in love with. 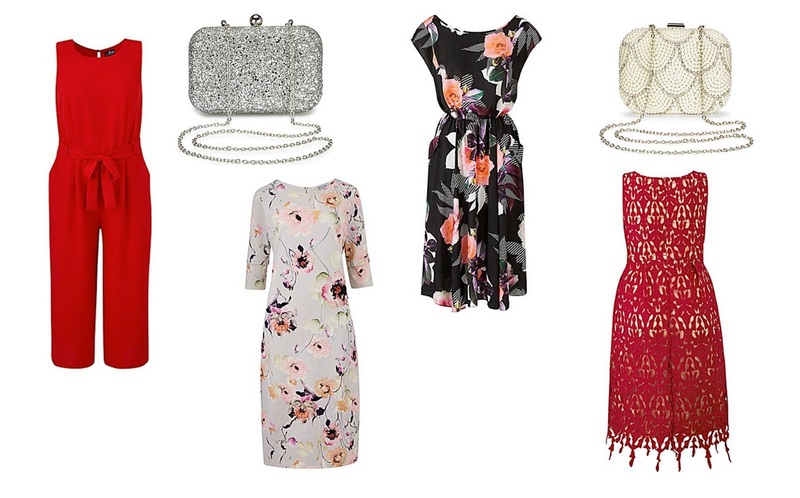 Even though the collection is mainly for weddings, their outfits and accessories are perfect for any occasion, so if you have a wedding to go to or are just looking for some new clothes for a night out, you have some fantastic options on their website. I think this red jumpsuit is my favourite out of all these items, personally I love throwing on a jumpsuit with a pair of heels and being ready to go! They are comfortable while still looking smart and elegant; this would look perfect paired with a bright red lip! This is a super versatile bag, because it's silver, I find it goes with so many different outfits. As I mentioned earlier, this could be worn on a night out so it definitely does not have to be used exclusively for weddings! The reason I love this bag is because it gives me a Great Gatsby vibe and I really love the pearl detail on it, it looks slightly more delicate than the Silver Glitter Clutch so could easily be worn with floaty casual dresses or smarter outfits too. This dress stood out to me immediately, it reminds me of a 'Self Portrait' dress with the lace detailing so it is definitely on trend at the moment. Like the Culottes, I love the red colour and think it would look beautiful with classic makeup looks like winged liner and a red lip. I think this dress is a classic wedding guest dress. It's the kind of dress I would normally choose as it's feminine with the floral pattern and I find that these patterns make more fitted dresses look more elegant. This is the most casual of all the dresses but would be perfect if you were an evening guest at a wedding. It is more dressed down than the others so if you don't like dressing up quite as much, it would be perfect. This style is also really flattering if you are not as keen on the form fitting dresses. Which item is your favourite? You can check out all the clothing pieces and accessories here!